Earth is the only planet known to have fire. The reason is both simple and profound: fire exists because Earth is the only planet to possess life as we know it. Fire is an expression of life on Earth and an index of life’s history. Few processes are as integral, unique, or ancient. Fire on Earth puts fire in its rightful place as an integral part of the study of geology, biology, human history, physics, and global chemistry. Fire is ubiquitous in various forms throughout Earth, and belongs as part of formal inquiries about our world. In recent years fire literature has multiplied exponentially; dedicated journals exist and half a dozen international conferences are held annually. A host of formal sciences, or programs announcing interdisciplinary intentions, are willing to consider fire. Wildfire also appears routinely in media reporting. This full-colour text, containing over 250 illustrations of fire in all contexts, is designed to provide a synthesis of contemporary thinking; bringing together the most powerful concepts and disciplinary voices to examine, in an international setting, why planetary fire exists, how it works, and why it looks the way it does today. 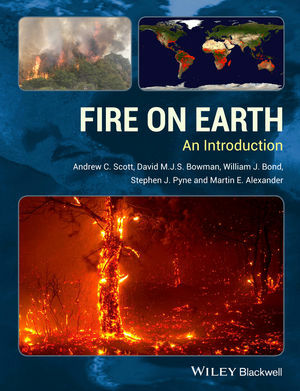 Students, lecturers, researchers and professionals interested in the physical, ecological and historical characteristics of fire will find this book, and accompanying web-based material, essential reading for undergraduate and postgraduate courses in all related disciplines, for general interest and for providing an interdisciplinary foundation for further study. Timely introduction to this important subject, with relevance for global climate change, biodiversity loss and the evolution of human culture.